I served in all commissioned ranks from Second Lieutenant to Major-General. And during that period, I spent most of my time being a high class muscle- man for Big Business, for Wall Street and for the Bankers. In 1775, in a Philadelphia bar named Tun Tavern, Commandant Samuel Nicholas held a recruiting drive to enlist the first Marines in the history of the United States. While the traditions and comradery will have an everlasting bond on these brothers in arms, many of those Marines who’ve been honorably discharged have opened their eyes to the harsh reality of the warfare state. Upon getting out of the Corps, myself and many of my fellow jarheads realized that we had simply been pawns for a controlling class who uses the military to strategically benefit their special interest groups. Fathers, mothers, sons, and daughters serve as little more than cannon fodder for elite oligarchs who’d never dare send their own child into these godforsaken deserts to wage war for oil. After all, the ruling class is much too busy running the economy into the dirt domestically to break away for such petty things as being blown apart by an IED while destabilizing Middle Eastern countries. Coming to the realization that you were nothing more than a pawn for the white shoe boys on Wall Street is a tough path to go down – especially after being indoctrinated into the world’s deadliest branch of the military. Yet still, many Marines and other former service members have been able to break free from this mindset and see war for what it is — large-scale murder. Those of us who have woken up to this reality are far from alone. In fact, one of the most famous Marines to ever wake up to the warfare state, did so in the 1930’s. After his retirement from the Marine Corps, Major General Smedley D. Butler made a nationwide tour in the early 1930s giving his speech “War is a Racket.” What separates Butler from other historical military figures is that he is one of only 19 people in history to win the Medal of Honor, twice. So, when a highly decorated, two-star general takes to the stage to assert that war is a racket, people listen — most people, anyway. Like the antiwar veterans of today, Butler also pointed out the incredible monetary costs associated with war, noting that it was the taxpayers who funded this expansion of empire. $52 billion in 1930 was a lot of money, and all of it stolen from American citizens and used by the oligarchs as investment money to turn them into billionaires. Butler was completely correct as well. Our children’s children and their children are still being buried under a mountain of debt for war. In his speech, Butler went on to name the actual companies who benefitted from the war and went so far as to specifically expose the increase in their bottom lines. But where did these profits come from? This was not some industry created by the free market. No, this was the beginning stages of the Global Industrial War Complex. Who provides the profits — these nice little profits of 20, 100, 300, 1,500 and 1,800 per cent? We all pay them — in taxation. Unfortunately, the ones who paid the dearest cost to enrich the elite were the soldiers themselves. Treated like prisoners, some of them against their will, were thrown into foreign countries and told who to shoot. The American soldier was and is an expendable commodity, traded on the international market, and sold to the highest bidder by Uncle Sam. When they proved no longer useful, the soldier was then cast out. Sadly, very little has changed today. Veterans are still treated like trash, thrown to the curb after serving their brief purpose of state-sponsored violence. Hundreds of thousands of veterans die before they even get to see a doctor. In the meantime, however, fat cats in D.C. receive golden parachutes and access to elite and entirely free health care for the rest of their lives — for sending these soldiers into harm’s way. Smedley Butler walked the walk. He had the street cred to say what he said and people listened. Unfortunately, he was only one man. However, when Smedley Butler was alive, printing his antiwar rhetoric in the newspapers was taboo. Luckily, for Butler and the rest of the world, we have the internet and no army can stop an idea whose time has come. Butler’s peaceful words live on, but it is up to us to keep spreading them. 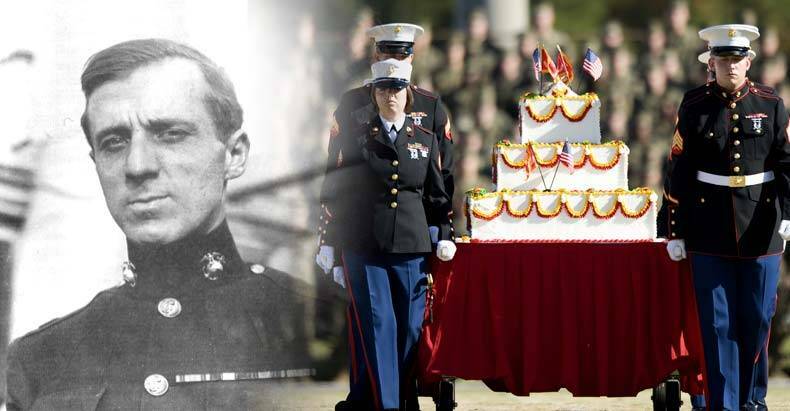 Happy Birthday, Marines. May your next one and all the ones after, be spent with your loved ones – at home and in peace.